South Korea’s president Park Geun-hye still has more than two years in office remaining, but already the nation’s next presidential candidates appear to have surfaced. These are early days, but South Korea’s single-term system rules out the current president for the 2017 election. And with the current president’s ratings down to an all time low, major shifts made recently by both the ruling and opposition parties have given prognosticators much to discuss. Moon Jae-in, who lost to Park Geun-hye in the 2012 election, was voted this week as head of the main opposition party, New Politics Alliance for Democracy (NPAD). The former lawyer has overtaken Seoul mayor Park Won-soon to become the most popular presidential candidate across the spectrum, according to pollsters. The sudden skyrocketing of Moon’s popularity may be due to the party conventions effect, which as time passes may recede. But Park’s downward trend in popularity suggests that any shortcoming of the opposition will be its own doing. Moon is also a strategic choice for NPAD. Every leftwing presidential candidate is virtually guaranteed full backing in the left’s traditional stronghold of southwest Jeolla province. But Moon has the extra advantage of being able to split the conservative vote because his constituency is the second most populous city, Busan, Gyeongsang province, which is usually the ruling Saenuri Party’s turf. Nonetheless, Moon faces the daunting task of reuniting a fragmented party that has proved an ineffective opposition to a president who has stumbled from one crisis to the next. NPAD’s recent approval ratings are down to just 24 percent compared with the ruling Saenuri Party’s 41 percent. Also from Busan is the ruling Saenuri Party’s chairman, Kim Moo-sung, whose election to the chairmanship last July, analysts say, had the presidential election in mind. Kim is a five-term political heavyweight: not too antiquated, but with enough clout within the party, if only to be handicapped by his relatively low profile in the public. Again, the fact that his constituency is Busan makes him a strategic choice for pre-empting Busan’s potential leftward swing. Kim also became chairman at a time when the party’s leadership came under fire for excessive submission to the president and is expected to restore parity between the party and the Blue House. It marks an end to the days when the pro-Park faction controlled the party leadership, with some analysts saying Kim represents an anti-Park sentiment amongst the conservatives. Nonetheless, he faces the challenge of steering the party’s relationship with an extremely unpopular president in the run up to the presidential election. Welfare in South Korea has recently become a political flashpoint and is likely to be a key election battleground. The Park administration originally ran on the attractive platform of expanding ”welfare without raising taxes,” namely corporate tax. But tax hikes on tobacco and vehicles were introduced last September, followed by the revelation this January that the annual income tax return method had been restructured in such a way that tax was effectively increased. That has fuelled the notion that the government had been taking from working class pockets, whilst failing to expand welfare because of fiscal constraints. Moon sides with calls for expanding welfare by increasing corporate tax, specifically on cash piles of the chaebol – large family-run conglomerates, which have been central to South Korea’s “economic miracle,” but are increasingly blamed for holding back the economy. NPAD has also for long been in favor of expanding welfare, particularly in the shape of free school meals to every South Korean child, whether poor or heir to Samsung. 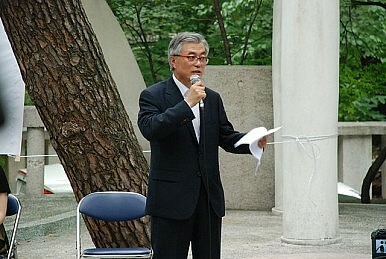 Saenuri party’s new leadership has flip-flopped its position on this. Kim was quoted as saying that “excessive welfare would make people indolent,” but then said expanding welfare is impossible without increasing taxes, only to retract that statement, realigning himself with the Blue House’s position of “welfare without increasing tax” and tax hikes as only last resort option. Recent polling shows that South Koreans won’t support more welfare, if it means they have to pay for it, but a 52.8 percent majority is in favor of raising corporate tax regardless of welfare. South Korea’s economy has become increasingly polarized, while its population ages more, making welfare a hot-button issue. How the next South Korean government navigates between a rising China and a rebalancing U.S. may vary somewhat depending on the party. The ruling Saenuri party is “security conservative,” preferring to take a strong stance over appeasement on North Korean provocations. Nonetheless, Park has remained open to a summit with North Korea without preconditions, despite North Korea’s continued nuclear program and jarring condemnations of U.S.-ROK military exercises. Conservatives have traditionally endorsed maintaining alliance and cooperation with the U.S., and Park’s support for U.S. sanctions on North Korea in the wake of the Sony hacking can be seen as a natural extension of that allegiance. As for China’s outreach, Park has been very responsive, especially on the cultural and economic dimensions – a departure from her predecessor Lee Myung-bak who had virtually neglected China. On the other hand, Moon is a poster-child of the rhetorically strident, “Roh-loyalists” – a faction of the left loyal to the legacy of the late president Roh Moo-hyun – known for appeasement and compromise in relations with North Korea. That all started with the Sunshine Policy of Roh’s predecessor, Kim Dae-jung. Whilst recognizing the security needs for alliance with U.S., NPAD has not hesitated to use anti-U.S. rhetoric, and remains open to fostering relations with a China that increasingly seeks to limit U.S.-ROK alliance cooperation. But as the youth, the NPAD’s previous voting base, increasingly turns its back on the party and becomes more security conservative, NPAD may find itself unable to pursue that leftwing tradition. If the current list seems dull, there is a dark horse. Just as the last presidential election had a surprise candidate in the software tycoon Ahn Cheol-soo, so the next one may also see one in the current UN Secretary-General Ban Ki-moon. Although Ban and his family have denied any interest, he received the highest rating as potential candidate back in November last year. Both parties have tried to claim Ban, and he could be a game-changer should he decide to run. Harry W.S. Lee is a journalist with chinadialogue in Beijing. His work has also appeared in ChinaFile, World Policy Journal, and the Korea Joongang Daily.